We will go to the Uluwatu, a cliff edge temple 100 meters above sea level, with fantastic views to the Indian ocean. This is one of the best settings for those amazing Balinese sunsets, filled with the traditional sailing outriggers (jukung). After sunset we’ll see a performance of the Kecak Dance, the most unique and popular of the many Balinese dances. An amazing interpretation of Ramayana legend performed by sixty of seated dancers, moving and swaying to an orchestration of natural voices. This is followed by the Sang Hyang Jaran dance in which a tranced dancer walks over a bed of hot coconut shell coals. For the evening’s finally, we’ll take you to Jimbaran Bay for a sumptuous dinner of select fresh grilled seafood served on the beach. Uluwaltu is one of Bali’s six directional temples and is the temples only site of significance. More remarkable than the temple itself is its location, perched on a steep cliff 70 meters above the roaring ocean waves. 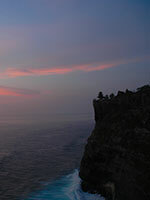 There are more steep headlands on either side, and sunsets over Uluwatu are a sight to behold. Note: while you are free to walk around the edges of the temple, the central courts can only be entered during special rituals. The temple is inhabited by large number of monkeys. Keep a very close grip on all your belongings and stow away your eyeglasses if at all possible. Jimbaran Bay Beach is a beautiful beach located in the southern part of Bali with white sand unfolding along the coastal. The last stop during Uluwatu Tour is visit this restaurant for having fresh seafood dinner. 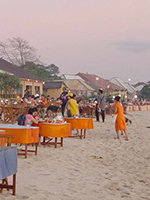 There are plenty of cafes offer delicious of seafood dinner with breathtaking view of Indian Ocean . It is served right on the beach with beautiful table set up apposite to the ocean. The chefs fire up their outside kitchens and prepare their menus of fresh seafood. The chef have special recipe make the food more delicious and will make you want again.